The twin shaft shredders are versatile shredders designed for shredding many types of bulky material in the primary stage. The shredders are extremely rugged and have a strong support structure to withstand all loads. Shredders are available in a wide range of electrical and hydraulic drive configuration. The blades are made from special hardened steel and are easily replaceable. The shafts are counter rotating and hexagonal in design ensuring excellent griping of the blades. The design of the blades varies according to the material being shredded. The shredders have low speed, high torque, low noise, low dust and low maintenance. The shredder is auto reversible in case of overloading. Higher capacity shredders are provided with two gear box system ensuring constant torque on both shafts. 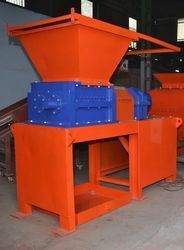 The twin shaft shredders are used for shredding of Medical Waste, Municipal Solid Waste, Wood, Biomass, Agricultural waste, Tyres, Plastic, E-waste, Packing material, textile, Drum, Metals, oversize bulky waste, industrial waste, General Waste, Hazardous Waste. The heavy duty shredders are manufactured by us up to 15 tons/hr capacity. Shredders for Municipal Solid waste available from 100 kg per hour to 15Tons/hr in Electrical as well as Hydraulic drive option. Feed conveyors and shredded material transfer conveyors are also supplied as per client requirement. Ever since the inception, it is our prime motive to meet the client requirements by offering an appreciable range of Municipal Solid Waste Shredder. These machines are used for recycling and process solid waste, which is generated from various industries. In order to manufacture high qualityMunicipal Solid Waste Shredder, our professionals employ advanced machines and utilize quality tested material procured from the authentic vendors. In addition, our machines are acknowledged in various international markets including Thailand, Indonesia, Malaysia, Philippines, Europe & USA. Taking into consideration the safety of environment, we are duly manufacturing and exporting Plastic Bags Shredder machines. Applicable for shredding the waste plastic bags, these machines ensure safe and healthy environment as the plastic is not biodegradable. The shredding machine is specially designed for waste management. There are different specifications and capacities in which these Plastic Bags Shredder machines are offered to clients at competitive prices. We shred any type of plastic material. 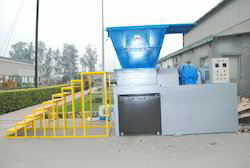 We are providing a wide range of Vegetable Waste Shredder to our clients. Taking into consideration the safety of the environment, we are duly manufacturing and exporting Plastic Shredder machines. Applicable for shredding the waste plastic bags, these machines ensure safe and healthy environment as the plastic is not biodegradable. The shredding machine is specially designed for waste management. There are different specifications and capacities in which these Plastic Shredder machines are offered to clients at competitive prices. Boasting of a robust infrastructure, we ensure to manufacture and export a technically advanced range of Biomass Shredders. Made and designed using premium grade steel at our ultramodern machining facility, these shredders also combined with durable casting, gear box and motors. Our Biomass Shredders are used to cut biomass waste into small pieces for handling purposes and for extracting fuel. Our shredders are exported to various international market including Hungary, New Zealand etc. Aluminum shredders are basically used to process the aluminum scrap that can be used in other purposes or Recycled for the production of new products. Our shredders are used to shred all kind of material fed into them. The Shredders are highly capable to shred the substances. These machines are particularly suited to the size reduction of bulky materials. Machines are supplied complete with electrical control panel, and are guarded to prevent access to moving parts therefore ensuring safe operation. Our double shaft shredders are robust and rugged machines with a throughput of upto 20tons/hr. Our shredders are high technology, robust, versatile and uniquely designed to handle bulky material like MSW, wood, plastics etc. Its heavy construction, wear resistant steel blades, top quality imported gearbox ensures high throughput and negotiable maintenance. shredders are used worldwide for destruction of Bio Medical waste. provides you the best shredded material in approx 50mm. Longer life to the cutters and entire equipments. The Coconut Husk Shredders are designed to handle the processing of the waste coconut husk and designed to operate at slower speeds, utilizing high torque and the tearing, crushing and shearing actions between counter rotating, opposing blades. These Shredders process the Coconut Husk to the fine size shredded materials that can be easily dumped or used as the BIO FUEL. You can also use it as a cheap fuel for the boilers. 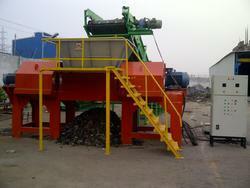 Metal Shredder Machine is developed for handling the various process needs in an oil mill processing plant. Our Cow Dung Cake Shredder are well known for there quality and applications. 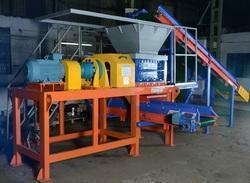 We are providing a wide range of Glass Shredder to our valuable clients. 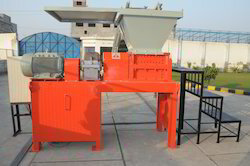 Our clients have recognized us as the trustworthy manufacturer and exporter of Paint Sludge Shredder. Equipped with adjustable knives, durable motors and gear boxes, these shredders are used for recycling or spreading industrial paint sludge. Our Paint Sludge Shredder is made by a team of veteran professionals by using quality approved materials, following the norms and guidelines laid down by the industry. Before the delivery of our machines to our client's end, we make sure that these are packed very carefully so that no damage occurs during their transport. RDF Shredders can effectively process Used tyres, Paint Sludge, RDF fuel, biomass, plastic, wooden crates, PVC/HDPE, aluminium & copper cables. Wide range of shredders for textile shredding upto 15 tons per hour. Our shredders are high technology, electromechanical, robust, productivity enhancing, versatile and uniquely designed to handle bulky material Its heavy construction, wear resistant steel blades, good quality imported gearbox ensures good productivity and low maintenance. Shredders for Municipal Solid waste and Biomass available from 1 Tons/hr to 20 Tons/hr . Feed conveyors and shredded material transfer conveyors are also supplied as per client requirement. Ever since the inception, it is our prime motive to meet the client requirements by offering an appreciable range of Municipal Solid Waste Shredder. These machines are used for recycling and process solid waste, which is generated from various industries. In order to manufacture high quality Municipal Solid Waste Shredder, our professionals employ advanced machines and utilize quality tested material procured from the authentic vendors. In addition, our machines are acknowledged in various international markets including Thailand, Indonesia, Malaysia, Philippines, Europe & USA etc. Shredders for Gunny Bags available from 10 kg per hour to 15Tons/hr . Ever since the inception, it is our prime motive to meet the client requirements by offering an appreciable range of Gunny Bag Shredder. These machines are used for recycling , which is generated from various industries. In order to manufacture high quality Gunny Bag Shredder, our professionals employ advanced machines and utilize quality tested material procured from the authentic vendors. In addition, our machines are acknowledged in various international markets including Thailand, Indonesia, Malaysia, Philippines, Europe & USA etc. Alfa Therm Shredder Machines are robust with highly technology designed to shred high moisture empty Sugarcane trash into approx. 50mm - 60mm size to use in biomass power plants in Kingdom of Saudi Arabia, Azerbaijan, Hungary, New Zealand, Germany, Fiji, Iraq etc. our shredder range is starting from 100kg per hour to 15tons per hour. The offered range is manufactured in using the finest selection of steels and modern technologies manufactured as per International Standard ISO: 9001:2008. The offered products are used to cut the empty Sugarcane bunch material into small pieces, which are widely used for various purposes like biofuel and composting preparation. The double shaft shredder cut the Rubbers to the minimum size and capable to shred 50kg/hour to 15 tons/hour. The rubber shredder precisely process the tire materials to produce the new items like rock substitute, cover and the most valuable high energy fuel can be derived from the fine shredded tires. Our shredders are high technology, electromechanical, robust, productivity enhancing, versatile and uniquely designed to handle bulky material like MSW, Wood, plastic etc. Its heavy construction, wear resistant steel blades, good quality imported gearbox ensures good productivity and low maintenance. our double shaft shredders are robust and rugged machines with a throughput of upto 15 tons/hr. 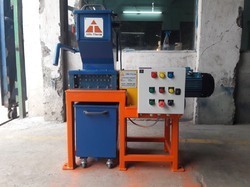 We manufacture shredder with capacity range starting form 10 Kg/ Hour to 15 Ton/Hour for various kind of Municipal Solid Waste, Plastic Waste (HDPE, LDPE, PP, etc), Tyre, Waste Paper, Biomass and Agro Residual Waste (Vineer Sheet, Coconut Husk, Rice Paddy Straw, Sugarcane Trash, Wheat Paddy Straw, Empty Fruit Bunches, etc). Equipment is designed for shredding of plastic hospital waste like blood bags, IV / blood transfusion sets, barrels, pistons of disposable plastic syringes, scalpel, blades, needles, glass etc. Easy & safe to operate. Low noise. Heavy & sturdy construction. Non corrosive cutter. Easy to clean & maintain. Shock proof insulated as per safety norms. These are fabricated of heavy duty frame with powder coated M.S. sheet. Equipment design permits easy & safe loading material through sturdy hopper and collection of shredded material in container avoiding spill over & prevent flying particles and aerosols, the shredding process being in a closed system. As a noteworthy entity, we are engaged in manufacturing and supplying the premium quality of Waste Shredder. Valued as a reliable manufacturer and supplier, we render our patrons with the finest quality of Tyre Shredder . Appreciated for its shredding efficiency, compact design and simple operations, the rendered tyre shredder is easy to operate. Rigorous quality assurance procedures at each stage of production of tyre shredder, ensures that its quality is never compromised. 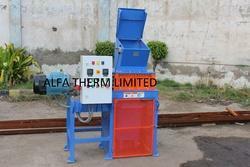 Alfa Therm Limited, Leading supplier of heavy duty shredders, offers Bio-Medical waste shredder, which is design for shredding of Bio Medical plastic waste generating in hospitals, Nursing Homes, Clinic Labs, Medical, Saline plastic bottles, Vials, ampules, syringes, scalpels, plastic catheters, intravenous sets, discarded medicines etc. Besides this, we also manufacture shredders in higher capacity upto 15 tons per hour for any kind of E Waste.